It has taken me a few days to put myself together. The graduation of the first VISIONAIRE students was wonderful and I admit that I cried. I’m going to miss meeting with everyone, but I know we will still stay in touch. 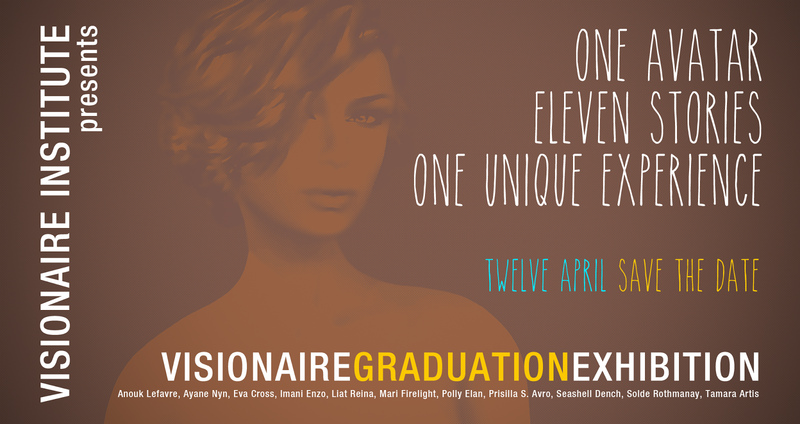 If you missed the graduation and/or the exhibit at the Penumbra sim, you can still catch their mini-galleries at this location: http://maps.secondlife.com/secondlife/New/166/225/3003 Be sure to follow them on Flickr (any of their wonderful works are not at the exhibit due to space and prim considerations). Congratulations: Anouk Lefavre, Eva Cross, Imani Enzo, Liat Reina, Mari Firelight, Polly Elan, Prisilla S. Avro, Seashell Dench, Solde Rothmanay, and Tamara Artis. Spring is in the air! FineSmith brings us flowers with the Botanica collection — which comes in many lovely colors (the photo is aqua). The ensemble features a head wreath, earrings, and necklace. You can see a bit of the dress called Spring as well. I’m feeling it! It’s great to burst forth from the snuggly confines of Winter!